Romanian soprano Elena Mosuc is connected closely to the Zurich Opera House, where she has sung many roles including the Queen of the Night, Konstanze, Donna Anna, Lucia di Lammermoor, and Giulietta. She has made appearances throughout Europe, as well as Japan and China and has worked with conductors such as Lorin Maazel, Sir Colin Davis, Christoph von Dohnányi, David Zinman, and Valery Gergiev. Her discography includes solo albums Au jardin de mon cœur, Mozart Portrait, and Notre Amour. Latest releases are the complete recordings of Schön ist die Welt by Lehár and The Magic Flute. 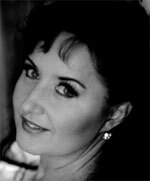 La soprano roumaine Elena Mosuc a tissé des liens étroits avec l’Opéra de Zurich, où elle a chanté de nombreux rôles comme la Reine de la Nuit, Konstanze, Donna Anna, Lucia di Lammermoor et Giulietta. Elle s’est produite dans toute l’Europe, ainsi qu’au Japon et en Chine, et a collaboré avec des chefs d’orchestre comme Lorin Maazel, Sir Colin Davis, Christoph von Dohnányi, David Zinman et Valery Gergiev. Sa discographie comporte des albums en solo tels que Au jardin de mon cœur, Mozart Portrait et Notre Amour. Ses enregistrements les plus récents sont les intégrales de Schön ist die Welt de Lehár et La Flûte enchantée. Die rumänische Sopranistin Elena Mosuc ist eng mit dem Opernhaus Zürich verbunden, wo sie viele Rollen einschließlich der Königin der Nacht, Konstanze, Donna Anna, Lucia di Lammermoor und Giulietta gesungen hat. Sie trat in ganz Europa sowie in Japan und China auf und arbeitete mit solchen Dirigenten wie Lorin Maazel, Sir Colin Davis, Christoph von Dohnànyi, David Zinman und Valery Gergiev zusammen. Unter ihren Einspielungen findet man die Soloalben Au jardin de mon cœur, ein Mozartportrait und Notre amour. Zu ihren jüngsten Aufnahmen zählen die vollständigen Fassungen von Léhars Schön ist die Welt und Mozarts Zauberflöte.